Who loves the sun? Everyone who visits El Paso, which boasts over 300 sunny days each year. For the best place to enjoy the sun, head to Franklin Mountains State Park. This park holds the reputation of being the largest state park within a city and offers rock-climbing in McKelligon Canyon and hiking on 125 miles of mountainous trails. The Franklin Mountains also serve as a fantastic backdrop for birding, rugged mountain biking and watching the bats take flight on summer evenings at dusk. Another great option for outdoor adventuring is Hueco (pronounced WHAY-coe) Tanks State Park & Historic Site, about 40 miles east of El Paso. This site is named for the natural rock basins that collected rainwater sought by ancient peoples. Today’s visitors seek out this sanctuary to hike and climb rocks, explore a historic ranch house and admire the 3,000-plus rock paintings left on walls by long-ago residents from ancient local tribes. To explore these wonders, you’ll need a visitor’s pass. 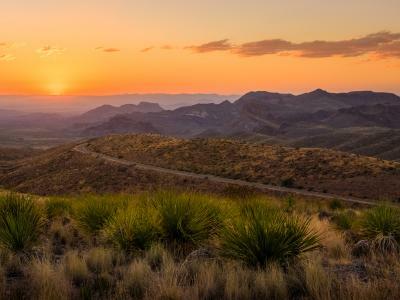 To sneak in some time in the wilds of West Texas, make the 100 mile drive from El Paso to Guadalupe Mountains National Park – one of our state’s best little-known wonders. Nearly 47,000 acres of designated wilderness and another 35,500 acres of backcountry add up to an exceptional and vast area to explore on foot, mountain bike or horseback thanks to some 80 miles of trails. The arduous climb up the 8,750-foot Guadalupe Peak - known as the Top of Texas - is one of more than 100 Big Bend Country mountains reaching more than a mile high. Around here, you’ll need your most rugged hiking boots. Here, you can see the second-largest gypsum dune field in the nation – the Salt Basin Dunes. For a popular hike, take the McKittrick Canyon, which crosses steams and winds through hardwood forests that turn brilliant colors in autumn. Down the road from El Paso some 250 miles, Monahans Sandhills State Park lies close to the neighboring cities of Midland and Odessa. When you get there, stop by the visitors center to buy a dune disc. Once you’re on top of the park’s glittering white sand dunes, you’ll be elated to find that the whole park serves as an otherworldly wonderland of sliding, skidding and toppling down the dunes. At different times of the year, you’ll see varied vegetation, such as purple-flowered vines, and there are always the distinctive shin oak, a short tree that helps stabilize the dunes and bears lots of huge acorns. For a nature-fueled refresh, head to Balmorhea State Park in Toyahvale where you can cannonball into the San Solomon Springs rock pool. South from Balmorhea, you can enter the Davis Mountains, and south of those, the Chinati Mountains will point you toward the mighty Rio Grande’s path dividing Texas from Mexico. And if you head west from Presidio on a narrow bumpy road, you’ll reach Chinati Hot Springs, a rustic retreat near Presidio where spring-fed baths ease away life’s tensions. Then, you can follow the magical River Road, which dips and climbs alongside the Rio Grande to Big Bend Ranch State Park, the village of Lajitas and the old Terlingua ghost town. 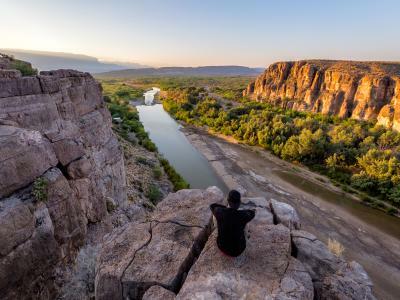 Beyond Terlingua, Big Bend National Park - an 800,000-acre reach of rock, desert and Chisos Mountains scenery - welcomes you for hiking, camping and rafting trips that can last from one day to three weeks. From Big Bend National Park, it’s a 200-mile trip east to Lake Amistad at the eastern edge of Big Bend Country. There, you’ll find a lakeside paradise for angling, hunting and birding in solitude. 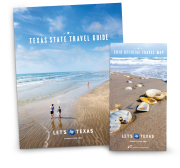 All kinds of nature lovers flock to West Texas to enjoy its sweeping vistas, mountainous landscapes and refreshing oases. And for an epically fun-filled family road trip, you can’t beat the views.